This area is the foundation for all further work. It requires children to complete a cycle of activity (take out the material, focus, put it away) and allows them opportunities for developing practical skills that help to maintain their classroom. Daily activities such as pouring water from one container to another, sorting activities, table scrubbing, grape washing and bread baking are designed to build fine motor skills, confidence, self-esteem, independence and concentration. Activities in this area refine the senses through specially designed materials, which isolate a particular quality such as shape, size, color, temperature or texture. 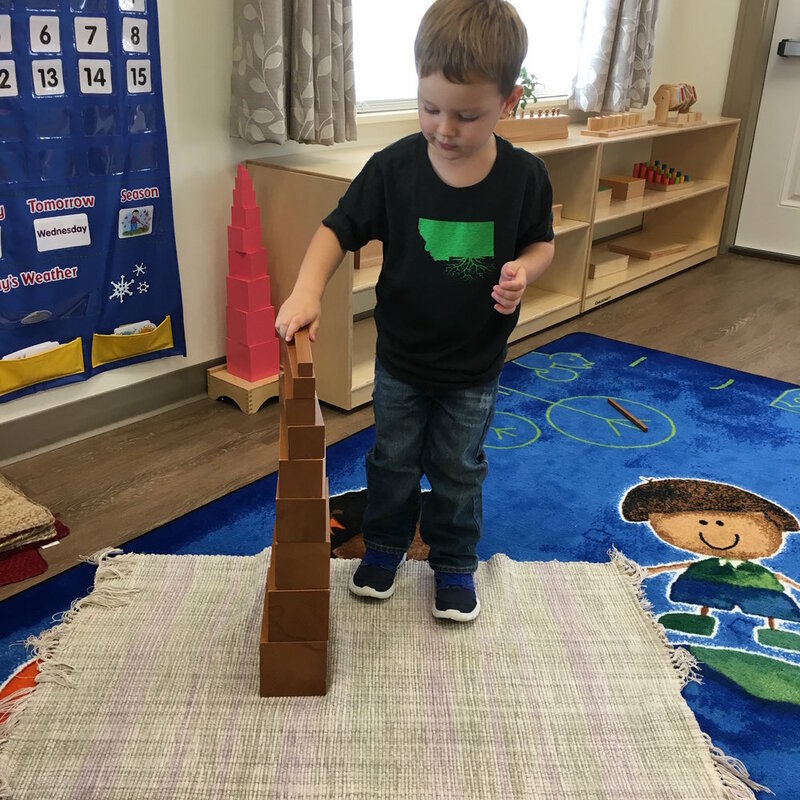 Precise and beautifully constructed, the sensorial material is among the most easily recognizable of all of the material designed by Dr. Montessori. This is an extremely important time for language development. Phonetic sounds are learned through fun activities like the "I Spy Game" and sandpaper letters, leading to word formation with the moveable alphabet and later to writing. Reading takes place first by matching picture cards to words. Early readers are introduced when the children are ready for them. Hands-on materials, such as the red and blue rods, bead bars, chains and cubes help the child to grow from concrete to abstract math concepts. Children are able to benefit from the math materials even before they learn to write numbers. Learning mathematics at this age is not repetitive rote learning. Children love to learn the quantities and symbols for numbers even into the thousands. Names of geometric shapes and solids roll off the tongues of three and four year olds, while others begin learning addition, subtraction, multiplication, division and fractions. Geography, history, the sciences, art and music are all covered using concrete materials that the child ma­­­nipulates. "Punching out" the seven continents is a favorite beginning geography project, which later evolves into detailed studies of foreign countries, the 50 states, Canadian provinces and the respective flags! Our goal is to develop a global perspective in our students.